Bill Daley inspecting the new Civil War plaque. The Historical Commission extends its highest praise and appreciation to Bill for spearheading this important project. The Civil War Memorial Wall Plaque has been delivered and it now hangs on the wall of the first staircase case landing at Town Hall. It shows the full names of the 294 Sandwich men who served as soldiers and sailors. A gold star is beside the names of the 54 men who lost their lives because of the war. As far as Cape Cod is concerned, Sandwich raised the first military unit on the Cape; the Sandwich Guards (Co. D 29th Regiment) saw the first military action; Sandwich had the most men join of any town on the Cape and sadly lost the most number of men. Sandwich was not alone in its losses; more than 600,000 Americans lost their lives during this 4 year nightmare. 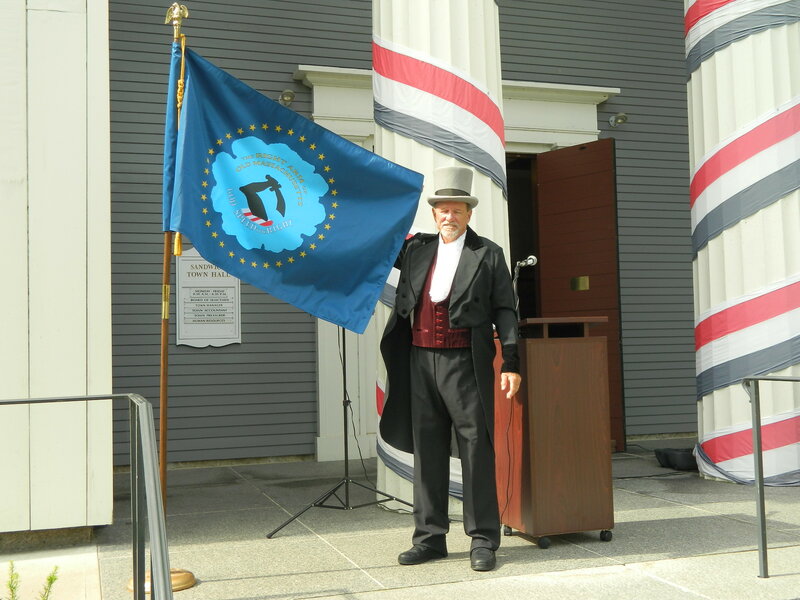 On the morning of May 18, 1861, in front of Sandwich Town Hall, Major Sylvanus Phinney presented Captain Charles Chipman of Company D, 29th Massachusetts, with a blue flag that read “The Right Arm of Old Massachusetts. God Speed the Right.” In the flag’s center was an image of a raised arm holding a sword. 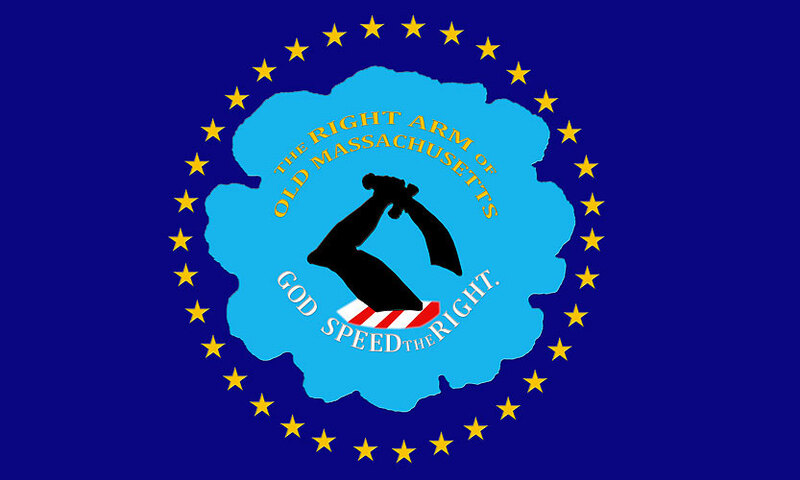 The arm represented the Cape as Massachusetts’s right arm. 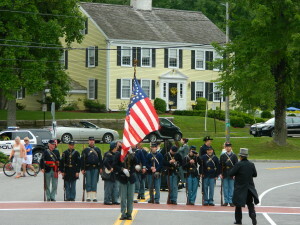 Shortly after the ceremony, Chipman’s unit left Sandwich for Boston and became the first military unit from Cape Cod to fight on the front lines of the Civil War. By the end of the war, Sandwich had lost 54 men. By the time President Ulysses S. Grant visited Barnstable in 1876, only fragments of the banner remained. As part of the Sandwich 375th anniversary celebration, that flag they received was reproduced by William Diedering III and once again was presented to Captain Chipman (as portrayed by Michael Welch) by Major Phinney (Robert F. Sennott Jr.) in front of Town Hall on Saturday, July 19, 2014. Then at 10 AM, about 46 reenactors began a parade from the Henry T. Wing School (which was renamed Camp Chipman for the day) to Town Hall where the Cape Cod Chorale sang Civil War-era songs. Following the flag ceremony, special attention was given to those soldiers who were killed in the war by means of a bell-ringing ceremony. According to the director of Sandwich 375 and chairman of Bringing Alive Sandwich History (BASH) William F. Daley, many people are unaware of the significant role Sandwich played in the Civil War. The reenactors consisted of the Sandwich Guard, the 3rd Massachusetts Light Artillery Battery C, and the US Sanitary Commission. After the town hall ceremony, they made their way back to Camp Chipman, where there were military drills and cannon demonstrations from the 3rd Massachusetts Light Artillery. In 2011 Commission Chairman, William Daley, wrote an article on the History of Sandwich’s Civil War Monument. It was especially fitting in that year when we commemorated the Civil War sesquicentennial, that we remembered the 293 Sandwich men who served and 54 men (Civil War Dead – Sandwich MA) who died in service to the nation in that war. 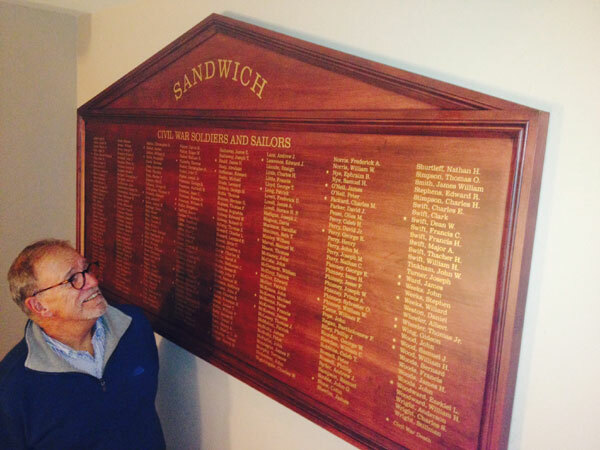 SANDWICH – There are large plaques of honor displayed in Town Hall, listing the names of Sandwich residents who served in World Wars I and II. Later this year, perhaps, a memorial listing of the town’s Civil War veterans and its war dead may also be displayed. The Sandwich Historical Commission voted 7-0 Feb. 5 to request $8,000 in Community Preservation Act funds this winter to underwrite a Civil War listing of the 215 Sandwich residents who served in the Union Army during the war. Commission member William Daley said he has documented 56 Sandwich residents who died in the war. He said the Town Hall war listing would include the names of all who served, including those from West Sandwich, which became the town of Bourne in 1884. Daley said the listing would feature names and might include military ranks achieved. If the CPA Review Committee votes to favorably recommend the $8,000, voters will consider the request at the May Town Meeting. Bourne’s memorial to its Civil War enlistees is located outside Town Hall at Perry Avenue, Buzzards Bay. Mostly overlooked by people coming and going on routine business in the building, it includes the names of those from what was then West Sandwich. The statue was dedicated July 4, 1923, nine years after Bourne Town Hall was built on the north side of the new canal. The Civil War statue in Sandwich, according to town records, went up May 30, 1911. 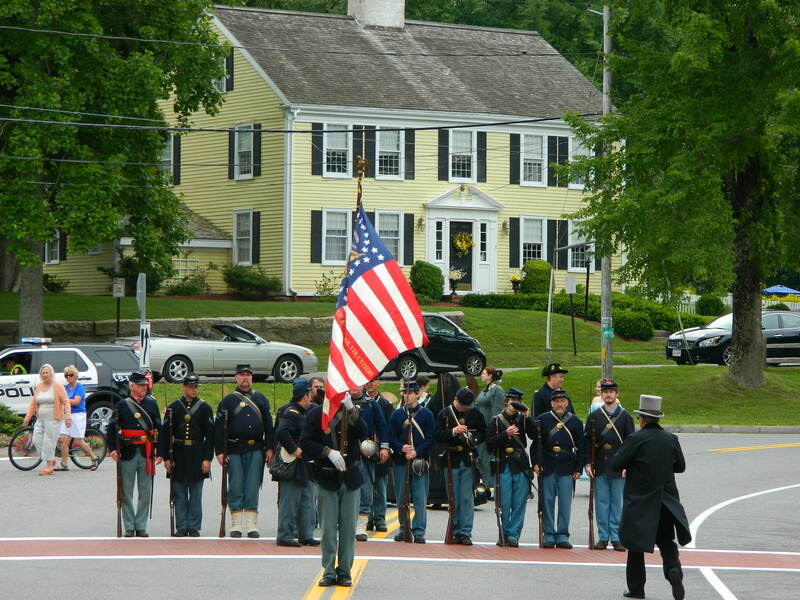 The annual Town Meeting of 1867 considered efforts to remember Civil War veterans. A Union Army soldier statue was decided upon. But the project was not undertaken for decades. The idea was likely forgotten as the years passed and Civil War stories and memories faded. Finally, William Eaton offered to pay for the memorial. Eaton’s only condition was that the area be named for his family. Townspeople agreed and the project was carried out. Today the statue commands the small park outside Town Hall, which has since been named Town Hall Square, a federally recognized designation. This entry was posted in History of Sandwich and tagged cape cod, casualties, civil, death, disease, sandwich, war. Bookmark the permalink. Now that Mr. Haddad has been properly given military honors and a head stone after being interred at St Peters for 97 years with out one . It would be appropriate to up date the historical facts and also remove the gold stars on the plaques that bear there names. Then history will remain true to the facts.